Three people were killed in Indianapolis on Friday morning, and three police officers came under fire in the latest flurry of violence in a disturbingly deadly year for Indiana's capital. A Indianapolis metro police officer was in good condition and was saved by his bulletproof vest, Indianapolis Metro Police Department tweeted, in the morning shootout. The suspect is believed to be one of the three who was killed. The incident happened just after 7 a.m. Friday, NBC affiliate WTHR reported. Detectives were at a home on the Eastside and were expected to be on the scene of the "very active crime scene" for a few hours, the police department said. That incident was the second in a matter of hours in which police took fire in the city. Two Indiana State Police troopers were unhurt when a rifle was fired at their SUV during a chase late Thursday night, the Indianapolis Star reported. 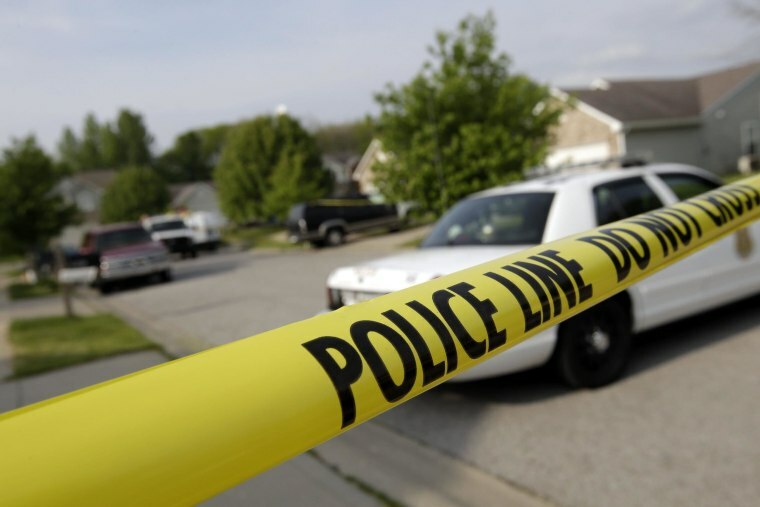 The number of homicides in Indianapolis is increasing rapidly, putting the city on pace to have its deadliest year in at least eight years, according to the Associated Press. Officials are keeping a close eye on Indianapolis — ranked 22nd on the FBI's list of deadliest cities — out of fear that violence could pick up as summer comes and rival the 162 killings the city had in 1998, the worst year on record. Desperate to quell the violence, Mayor Greg Ballard has met with gang leaders and proposed about $29 million a year in tax increases to beef up the police force. But the number of killings keeps rising: There were 63 for the year as of this week, the AP said. By comparison, Columbus, Ohio, which is similar in size, has had 40 so far this year. Most of the killings have involved criminals killing other criminals, the AP said. Officials believe the violence is rooted in decades of poverty and broken homes. Authorities are considering imposing a curfew and creating programs for community policing, plus offering more summer jobs and after-school athletics.